An experienced corps led by seven seniors, six who have played all four years in the program and five who started at least one season before 2013. Speed at all positions and discipline from the ends and outside backers. A close-knit 21-member roster that features six siblings. A coach who has built great defenses and already has three state championship rings. Those four reasons have help form Kansas’ No. 1 ranked eight-man defense for Wallace County- Sharon Springs. The Wildcats have outscored opponents 506-52 en route to a 12-0 record and Eight-Man, Division II championship game appearance this Saturday against 11-1 Baileyville B&B at Newton’s Fischer Field. No other eight-man program has allowed fewer than 122 points this season. Coach Kevin Ayers is 3-0 in state games with titles at Jetmore in 2001 and ’03 and a state crown with Wallace County in 2007. “At the games, a lot of teams, a lot of coaches are very impressed with how disciplined our boys are,” senior safety Kyle Gfeller said. Last year, Ness City permitted 71 points and finished 13-0 with the Eight-Man, Division I crown. That marked the fewest points allowed by an eight-man team since Prep Power Index started to track the statistic in 2006. Plus, the Wildcats have played the No. 6 strength of schedule in the classification and have a resume full of quality wins. In the regular season, Wallace County defeated Dighton 51-0 in Week 1, Hoxie 36-28 in Week 2 and Hanover, 22-6, at a neutral site game in Week 5. All three teams won at least one playoff game. It also defeated playoff qualifier Weskan, 49-0, in Week 8. In the postseason, the Wildcats shut down Thunder Ridge with a 53-6 victory, defeated Dighton 51-6 and then beat Beloit/St. John’s-Tipton 31-6 in sub-state last week. Wallace County is outstanding in two key areas: run defense and turnovers. This season, the Wildcats have forced 27 turnovers and are plus-24 in turnover margin. Wallace County has 10 non-offensive touchdowns, four each from Gfeller and senior Cayden Daily. Ayers has emphasized turnover margin since the offseason. In the previous four years, Wallace County was plus-12, minus-5, plus-6 and plus-4 in turnover margin. “We have always really stressed it, but we have just ramped it up,” Ayers said. In the playoffs, the Wildcats have held teams to an average of 86.3 rushing yards per game and 2.4 yards per carry. 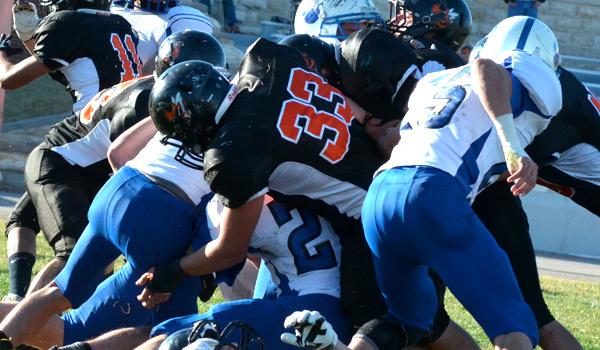 The run started when it limited Thunder Ridge’s powerful running offense to four yards a carry. Wallace County had lost to the Longhorns three straight years in the playoffs. “Last three times that we played them, they pounded us in the A and B gap, so we really worked on the ends smashing down, blowing up that A gap and B gap,” Gfeller said. In the regular season, Wallace County’s 3-2 defense permitted Weskan 14 rushing yards on 13 carries and Hanover 96 rushing yards on 21 carries. “We couldn’t match their speed,” Thunder Ridge coach Jerry Voorhees said. The Wildcats start seniors Dalton Walker, Tyrell Springsteel and Schemm on the defensive line. Walker and Schemm were all-state last season, while Springsteel has played very well in his first season as a starter. “We got more experience in other areas,” Clay Schemm said. Junior Nate Klinge and sophomore Luke Schemm play linebacker, while Daily and senior Callahan Grund are at the corners. Schemm, who has impressed Ayers with his work ethic and intelligence, leads the team with 77 tackles. Gfeller, with a team-high seven interceptions, is at safety. Daily returned a fumble for a score against Thunder Ridge and has enjoyed a breakout season. “That’s always been there," Ayers said. "He had his opportunity to shine (against Thunder Ridge). He has been a tremendous player for us for several years, super intelligent kid, hard working. He just is a worker." Virtually everyone has improved from last season. Clay Schemm leads the team with 10.5 sacks and four fumble recoveries, while Springsteel has 9.5 sacks. The Wildcats have 26 sacks, 1.5 more than they had in 2012 on a 10-1 team that allowed 100 points and lost to Thunder Ridge in the sub-state championship game. Clay Schemm and Luke Schemm are brothers, along with Springsteel and junior Peyton Springsteel. Grund’s younger brother is Chisum, a freshman. Grund and freshman Chisum Grund play defensive back and line. Wallace County also has Nate Klinge and freshman Gabe Klinge and junior Ivan Montes and freshman Sammy Acquino.